T2 Fire Risk Assessors UK Ltd - Alarms/Security based in Dartford, Kent. Welcome to T2 Fire Risk Assessors UK Ltd We are an independent fire safety company offering current best practice advice and guidance to industry in accordance with the Regulatory Reform (Fire Safety) Order 2005 (RRFSO) which is the principal legislation that governs fire safety in the UK. 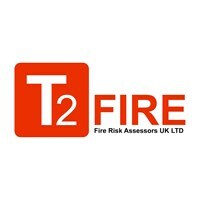 T2 Fire specialise in Fire Risk Assessments. All of our team are experienced, we carry out 1000's of Fire Risk Assessments every year. Our Fire Risk Assessors aim to be with you on the same day or following working day depending on urgency. Reports can be to you on the same day or within 48 hours of the assessment if required. Then you require a suitable and sufficient fire risk assessment. T2 Fire Risk Assessors UK Ltd cover the south of England and have large contracts throughout the UK.